According to a new market report published by Transparency Market Research titled “Thyristor Market – Global Industry Analysis, Size, Share, Growth, Trends, and Forecast, 2018 – 2026,” the global thyristor market is expected to reach US$ 7,225.9 Mn by 2026. The market is projected to expand at a CAGR of 7.0% during the forecast period from 2018 to 2026. According to the report, the global thyristor market will continue to be influenced by a range of factors such as their better reliability and cost savings compared to conventional solutions, replacement of aging infrastructure, and government initiatives. 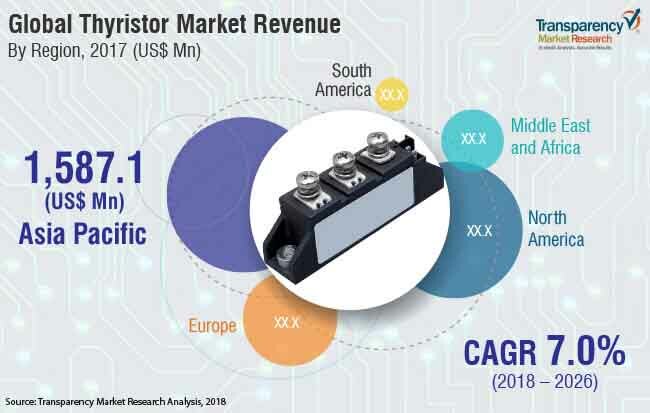 Growing usage of thyristors in consumer electronics is anticipated to drive Asia Pacific to the forefront of global demand, with the market in the region holding bulk of the share of the global thyristor market throughout the forecast years. The global thyristor market is segmented by power rating into below 500MW, 500-999MW, and above 1000MW. 500-999MW segment is expected to surpass US$ 2950 Mn by 2026. Thyristors are being extensively used across all power rating segments around the globe. On the basis of application, the thyristor market is segmented into industrial electronics, consumer electronics, communications, and automotive electronics. The consumer electronics segment is expected to hold the major share of the market throughout the forecast period because of Asia Pacific’s increasing demand for thyristors in consumer electronics. Asia Pacific is expected to hold higher market share for thyristors during the forecast period. The growth is mainly due to the increased adoption of thyristors with the presence of well-established players across the region, especially in China and Japan. Asia Pacific is also expected to emerge as the region showcasing the highest CAGR. Furthermore, Asia Pacific is witnessing high adoption of thyristors due to the increasing demand for energy to support the local manufacturing units. Major players in the thyristor market include ABB Ltd, Siemens AG, Schneider Electric SE, Eaton Corporation Plc., Honeywell International Inc., Analog Devices, Inc., STMicroelectronics N.V., Infineon Technologies AG, ON Semiconductor, and Fuji Electric Co., Ltd. The “Thyristor Market – Global Industry Analysis, Size, Share, Growth, Trends, and Forecast, 2018 – 2026” report provides analysis for the period 2016–2026, wherein 2017 is the base year and the period from 2018 to 2026 is the forecast period. Data for 2016 has been included as historical information. The report covers market dynamics including drivers, restraints, opportunities, and trends expected to influence the growth of the global thyristor market during the forecast period. The study provides a holistic perspective on the market’s growth in terms of revenue (in US$ Mn) across different geographical regions, namely North America, Europe, Asia Pacific, Middle East & Africa, and South America. The report highlights the key trends affecting the market on a global scale. Furthermore, region wise prominent countries/regions covered in the report includes the U.S, Canada, Germany, France, the U.K, India, China, Japan, GCC countries, South Africa, and Brazil. This report analyzes and forecasts the market for thyristors at the global and regional level. The report includes a detailed value chain analysis, which provides a comprehensive view of the global thyristor market. Porter’s Five Forces model has also been included to help understand the competitive landscape in the market. The study encompasses market attractiveness analysis, wherein end-users are benchmarked based on their market size, growth rate, and general attractiveness. This research study on the global thyristor market provides a detailed cross segment and cross country analysis based on the different segments including power rating and application. Based on power rating, the market is segmented into below 500MW, 500-999MW, and above 1000MW. On the basis of application, the market is segmented into industrial electronics, consumer electronics, communications, and automotive electronics. The report covers well-established players such as ABB Ltd, Siemens AG, Schneider Electric SE, Eaton Corporation Plc., Honeywell International Inc., Analog Devices, Inc., STMicroelectronics N.V., Infineon Technologies AG, ON Semiconductor, and Fuji Electric Co., Ltd.